Foliar K-27 is a complexed liquid source of high grade potassium glucoheptonate. Fertilizer analyses express potassium as K₂O on the label, when the actual plant available form of potassium is K⁺. Through our proprietary process, the elemental potassium source is reacted to gas off the oxide, resulting in K⁺ with no excess baggage. Foliar K-27 also contains two other proprietary sources of organic potassium and 15% organic acids. Foliar K-27 is pure potassium! A low salt index product that contains no oxides, such as chlorides, nitrates, carbonates, or sulfates. 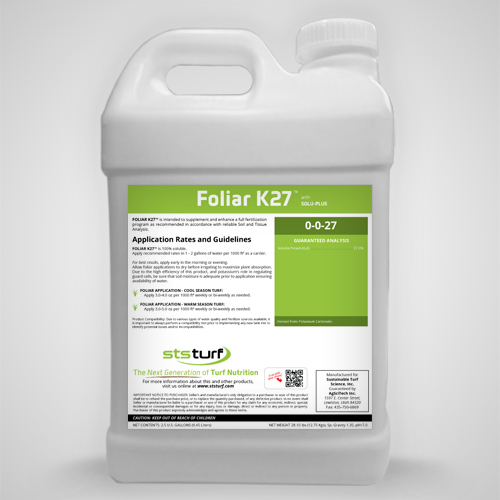 Foliar K-27 is formulated to assist with photosynthesis, and activate enzymes to metabolize carbohydrates for the manufacture of amino acids and proteins. This product facilitates cell division and growth by helping move complex carbohydrates and sugars between plant parts. Use as an effective tool to increase turf rigidity, and to boost tolerances to stress, drought, and general wear.